I like to shoot overhead camera shots to help explain things in the videos I make. Unfortunately, if you shoot directly down from a tripod you will see the tripod legs in the shot. I built this simple camera rig to allow me to move the camera out from the tripod and keep the tripod legs out of the shot. A hole needs to be drilled through the center of the box tube so that the box can be attached to the tripod. On one side of the box tube this hole is drilled to 1/4" to accommodate the tripod screw, while the hole on the opposite side of the box should be drilled to 1/2" to fit the coupling nut. 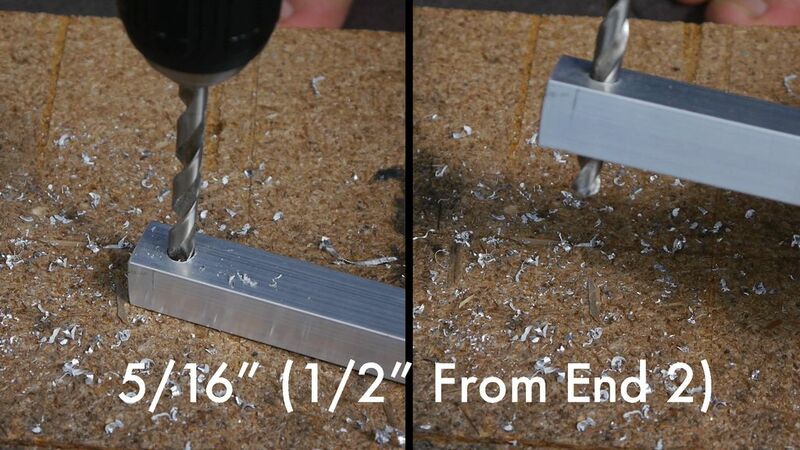 Measure 1/2" in from both ends of the box tube and drill through the box (in the same direction as the previously drilled center hole). The hole on the one end of the box tube should be 1/4" in diameter, while the hole on the opposite end should be 5/16" in diameter. The 5/16" hole is for the carriage bolt, which needs a square hole on the one side. Square the hole on the bottom side of the box tube by using a Dremel tool with an appropriate cutter (I used a carbide cutter as these things cut just about everything). The bottom side of the box tube is the side with the 1/4" hole in the center. Alternatively, the top side of the box tube has the 1/2" hole in the center. After the holes were finished, I attached the tripod plate to the center of the box tube using the coupling nut. The box tube can then be attached to the tripod. The ball head is attached to the end of the box tube with the 1/4" hole in it. Use the cap bolt to secure the ball head. Once the ball head is secure, the camera can be secured to it. The carriage bolt is attached to the end of the box tube with the square hole. This bolt can be secured with a nut if desired, but it can also simply be held in until the washers are tightened down with the wing nut. Add sufficient washers to the top of the carriage bolt such that they perfectly counterbalance the weight of the camera attached to the ball head. As a side note, you'll notice that I added a second carriage bolt and stack of washers. This was necessary as the camera could not be fully counterbalanced when the 3" carriage bolt was full of washers. Even with two stacks of washers, I was not able to fully counterbalance the camera. Since washers were getting expensive and I didn't want to run to Lowe's again, I decided to take advantage of some physics and simply move the pivot point of the box tube toward the camera. I drilled a second mounting hole for the tripod about 2" toward the camera and was able to get the camera balanced with the two stacks of washers I had. I was very pleased with how this camera rig came out and I've used it for a few videos with very good results. It is relatively stable and I really like that I can adjust the camera height by simply tilting the tripod head up and down and adjusting the ball head to keep the camera pointed directly down. Nice idea. Gonna make this. I'm glad to hear you were inspired! Thanks! In the past month or so of use it has come in very handy. which camera is that in thumbnail ?